I'm not sure why, but I've always had a strong connection to the color blue. So as you can imagine, it was a dream come true to experience an entire city dedicated to various shades of it painted as far as the eyes can see. Together with my boyfriend, stepping into Chaouen's labrinyth of dizzying blue alleyways felt like walking into another world. While there are quite a few ways to get to Chefchaouen, I came in via private car since it was part of one of many stops during a larger road trip adventure throughout Morocco. While it is certainly a long drive, I highly recommend having your own car because it will allow you to easily explore all the surrounding areas without issue and at our own pace. It also pretty interesting to pick up a few Moroccan hitchhikers that were traveling in the region who ended up recommending some cool places to visit like Oued Laou and Akchour. If you don’t want to deal with renting a private car, you can also arrive by bus or via overnight train from Marrakech to Tangier, then a taxi from Tangier to Chefchaouen. While I believe The buses are surely much cheaper, but based on what I’ve seen online, the train is far more comfortable (if you book in advance). 3-4 days is sufficient to comfortably explore the city and it’s surrounding areas. Always carry tissues and/or toilet paper. Public restrooms here typically don’t have any. Cash is king, don't bother with credit cards. There's an ATM in the main square in case you need. Friday is considered a Holy day (as is the case in all Muslim countries), and most shops will not be open. Pick up a local SIM at any of the convenience stores. It's very affordable and best way to have access to data consistently. Languages spoken are primarily Spanish, Arabic, and French throughout the city. However, it's not hard to find people who also speak fluent English. Prepare to constantly be offered hashish (aka marijuana) or be solicited tours that visit the fields where it grows. It has a long been part of the culture of the region as the plant grows abundantly in the nearby Rif Mountains. By the time we arrived in Chefchaouen after road tripping the country for a few weeks, I was tired of tagines tbh. Instead, we opted for lots of mint tea, fresh bread baked in a traditional wood-fired oven, local Jben cheese (so good! ), and fresh picked produce. However, there were a few memorable restaurants we stopped by that left amazing impressions. Beldi Bab Ssour was recommended to us by a staff member at our riad when I asked her where she typically has her lunch or dinner. It didn't disappoint! There were loads of locals and seemingly few other travelers there when we had dinner there, and thankfully they offered more than just tagines. La Lampe Magique Casa Aladdin was another great place, not so much for it's food but for its amazing view of the square that overlooks the medina. Prices here are almost double what you'd pay elsewhere in the medina, but you wont to find a better view. Stop here at least once. Chaouen is a dry city (little to no alcohol) and Hotel Parador is your only choice in the event you'd like to indulge in some. The hotel is one of the largest and most central in city, so it's pretty hard to miss. Stop in for some beer, spirits or a few very basic cocktails. Even though the accommodations are not as vast and varied as what you would find in larger cities, we experienced some lovely and quaint riads during our stay. Our first night was spent at Casa Perleta which was just so adorable and located in an ideal area of the medina for us. It was quiet, had an amazing terrace with beautiful views of the city and because it wasn't too far from the medina entrance, we didn't struggle to carry our bags far. We then switched over to Riad Cherifa, after deciding that we needed more space - and I am SO GLAD we did. The decor there was beyond stunning, had access to a lovely pool (that tbh we didn't even use) and were spoiled with some of the best breakfasts I had during my entire stay in Morocco. It's located a stone's throw away from Perleta, which was perfect as we wanted to continue staying in this area of the medina. Another great place to stay (especially if you want to have a hammam/spa experience) is Lina Ryad. Get lost in the medina. While I haven't been to every medina in Morocco, I feel certain in assuming that Chefchaouen has the most beautiful and interesting one in the country. How could it not be, with its narrow winding streets painted in the most beautiful vibrant blue hues? Compared to other larger cities, the medina here is relatively small, so even if you get lost (that's part of the fun) you can easily find your way out. Walk aimlessly throughout the city, meet the people, and of course photograph the visual feast that exists on every corner. Watch the sunset from the Spanish Mosque. 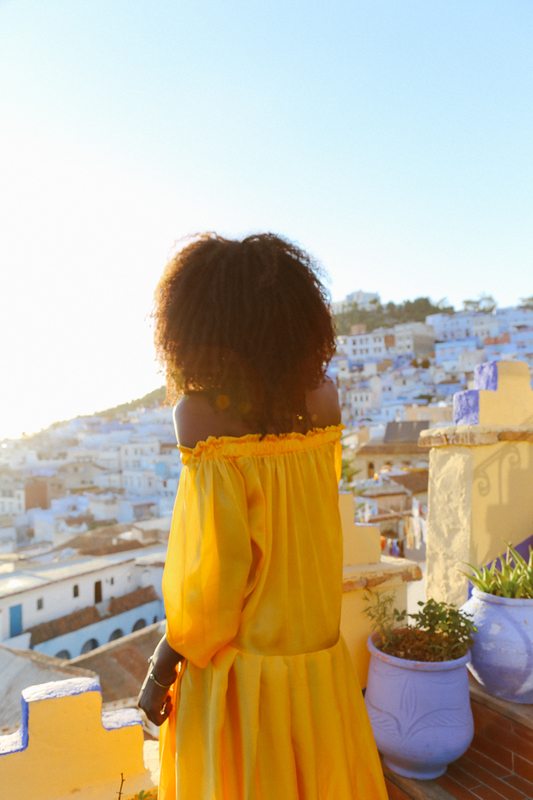 Once you're back in Chefchaouen, be sure to take another quick hike up from the main town to the lookout point. Day trip to Akchour: Don't miss out on spending the day in this area, which is just a 45 minute drive away from Chefchaouen. Get there early in the day (it's mostly visited by traveling Moroccans) and spend the day jumping into the waterfalls and hiking the trails. We packed a picnic for ourselves, but there was really no need because there are several local restaurants and stations where you can get a snack before or after the 2 hours hike to the largest waterfall. Much like everything else in Chefchaouen, the souks here were far less intense than other parts of the city I had visited. The stalls were much smaller and it felt like each item was very high in quality, where I felt like I had to sift through loads of cheap items in Marrakech to find quality goods I really loved. While you can get everything from ceramics, leather bags, woven totes & tablecloths, wool hoodies, and of course powder paint, my favorite goods to buy were the amazing fragrances and stop handmade soaps at La Botica de la Abuela Aladdin.